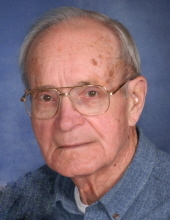 Paul S. Lewis, 88, of Meadville, passed away peacefully on Saturday, February 2, 2019. Paul was born in Meadville, on September 1, 1930, a son of the late Fred and Theresa (Keckeisen) Lewis. On December 28, 1974 Paul married Angelina "Angie" Tartaglione; she survives. He was a member of St. Mary of Grace Roman Catholic Church. After many years of service, Paul retired from the former Talon, Inc. of Meadville. A veteran, Paul entered the US Navy on August 24, 1950 and served his country honorably until his discharge on June 24, 1954. Most of his service time was aboard the USS Caperton and he was awarded the United Nations Service Medal, Navy Occupation Service Medal with European Clasp, Good Conduct Medal, National Defense Service Medal and the Korean Service Medal with one Star. He was a member of VFW Post #2006 and Meadville Elks BPOE #219. His hobbies included following sports, golfing and gardening. Paul will be most remembered for his deep devotion to his family. He will be sadly missed. In addition to his wife, Angie, of 44 years, Paul is survived by two sons Paul B. Lewis (Brenda), David Lewis (Tamie) both of Victorville, CA, six grandchildren Nicolina, Taren, Joshua, Jake, Joseph, James,five great grandchildren, several nieces and nephews. In addition to his parents, Paul was preceded in death by two brothers Robert Lewis, Fred Lewis, two sisters Betty Mitrich and Rita Bruce. Family and friends are invited to call on Tuesday, February 5, from 2-6 PM at STEPHEN P. MIZNER FUNERAL HOME & CREMATION SERVICES, INC., 404 CHESTNUT ST., MEADVILLE, with a Elks service at 4:45 PM, and a Scripture Service at 5:30 PM. A Mass of Christian Burial will be celebrated on Wednesday, at 11:00 AM at St. Mary of Grace Church, 1085 Water St., Meadville, with Fr. Jeffrey Lucas officiating. Paul will be laid to rest in St. Brigid Cemetery with Full Military Honors by VFW Post #2006. Memorial contributions may be made to St. Mary of Grace Church, 1085 Water St., or Meadville Elks C/O A. Bluxome, Secretary, 519 Hartz Ave., or Crawford Heritage Foundation, 415 Chestnut St., all in Meadville , PA 16335. To send flowers or a remembrance gift to the family of Paul S. Lewis, please visit our Tribute Store. "Email Address" would like to share the life celebration of Paul S. Lewis. Click on the "link" to go to share a favorite memory or leave a condolence message for the family.